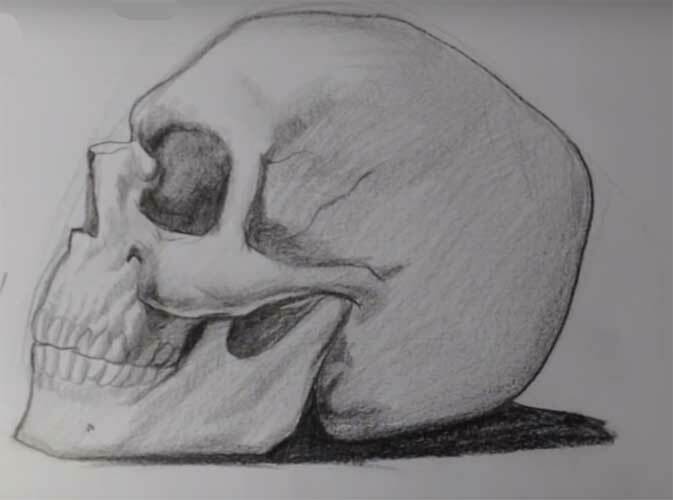 How to draw a skull very interest and fascinating topic! 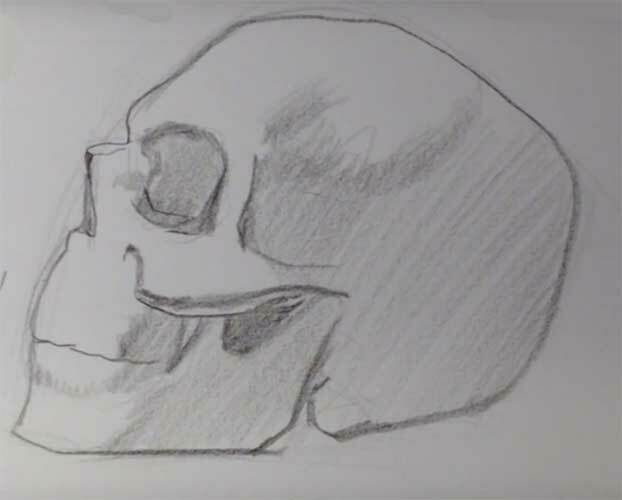 Learn how to draw 7 different skulls! All you need is a pencil and paper. You can also use a pen, marker, crayons, or any other drawing materials you may have. In this drawing lesson, you’ll learn how to draw the essential features of 7 different funky skulls. 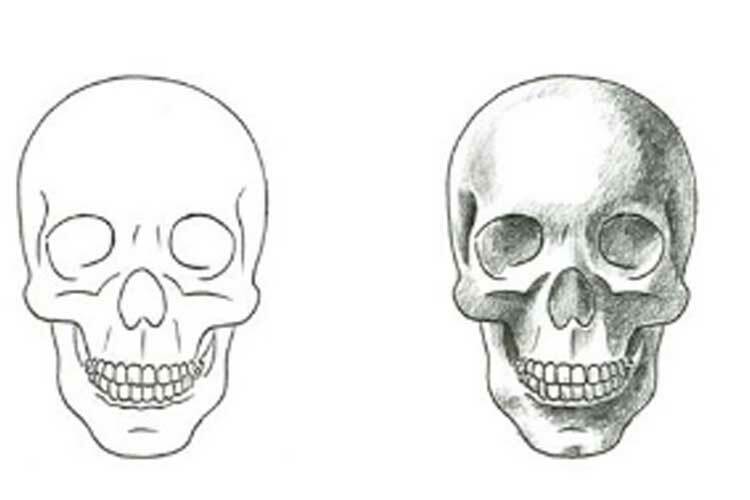 For examples, see my skull drawings on the right. 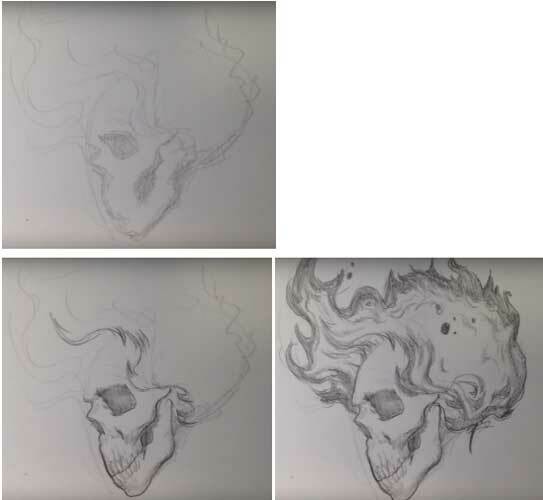 These were all done in pencil and are the basic outline for the fancy, intensely-decorated skulls. It is associated with death or lack of fear of it. 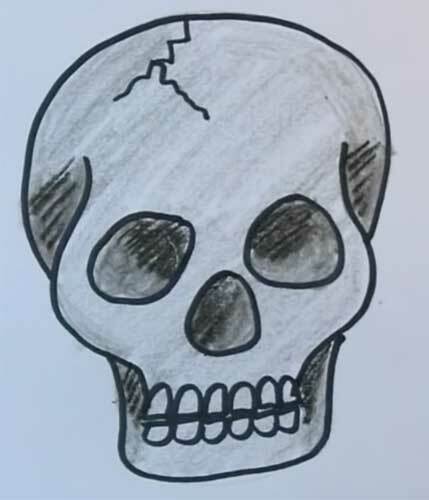 This symbol has been used for a long time and can denote not only death but an also vital energy and the concentration of intelligence.The image of the deadhead is used in Orthodoxy, the so-called “Adam’s head”, and also decorate the hall on Halloween with such a pattern. As you already understood, today our lesson is about the skull. First, let’s draw some skulls! For the image of the proportional skeleton of the head, you can use geometric shapes. 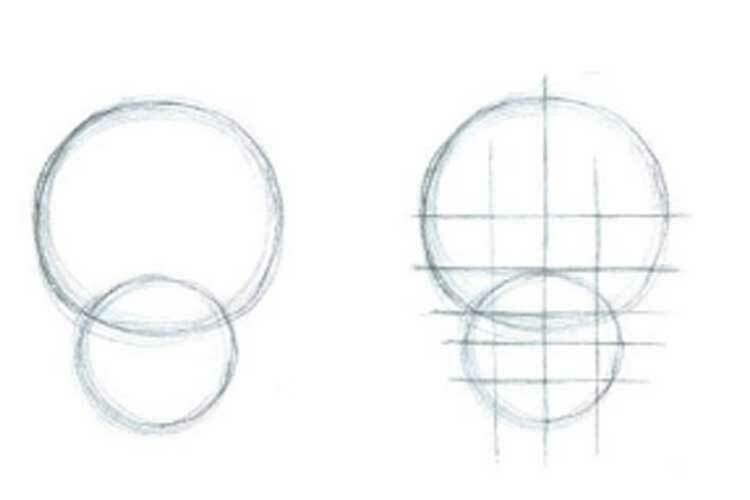 Draw two circles and draw a grid, as shown in the figure. Draw the outlines of the eyes, nose and mouth symmetrically with the drawn network. Paint the cheekbones and small details of the “face”. Arm with an eraser and remove the extra pencil. Shade the head, not forgetting the game of light and shade. Here is such a drawing. I remember the famous lines: “To be or not to be? – That is the question”. We tell you: “To be!” Follow the diagram below, and you will have a fantastic image. 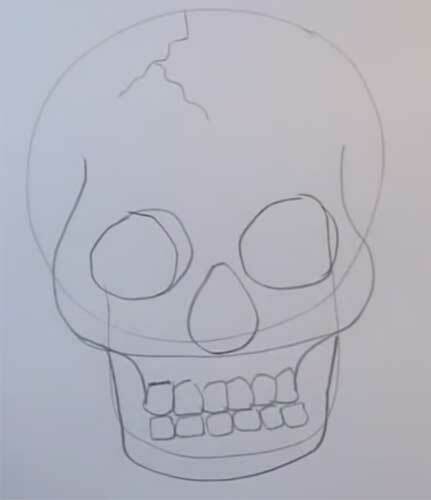 Outline the main outlines – this is directly the shape of the head, eye socket, temporal bone and other trifles. Paint the eye, cheekbone, mark mouth gap. Draw outlines and start shading. 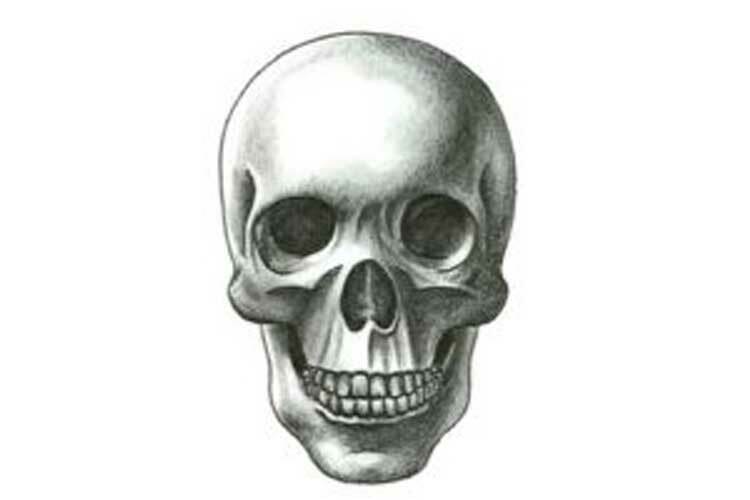 Draw your teeth and paint a shard with small strokes, draw a piercing in the temporal bone. Add shadows. As our object lies on the surface, show the darkness falling on it. Done! 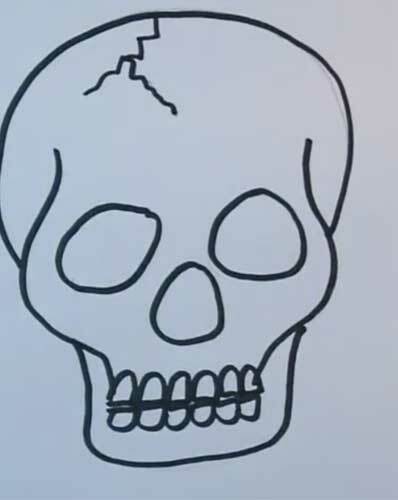 For beginning artists, we suggest drawing an easy way to draw a skull. It is not realistic, but it retains the essence. 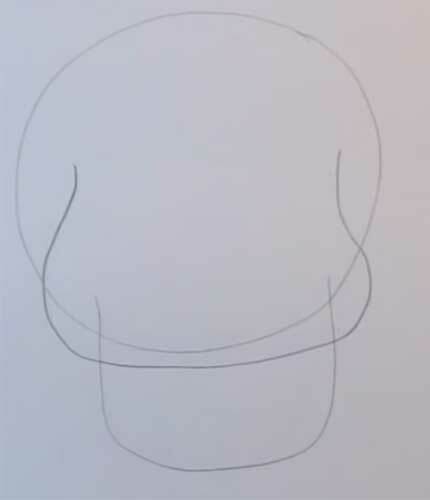 Draw a circle, then draw a U-shaped line to it. Then draw a curve like something like a pot or a horseshoe (here, as your fantasy allows). Paint the eye sockets and oval nose. From your horseshoe, draw the upper jaw and two rows of teeth. Draw a crack on the back of your head. 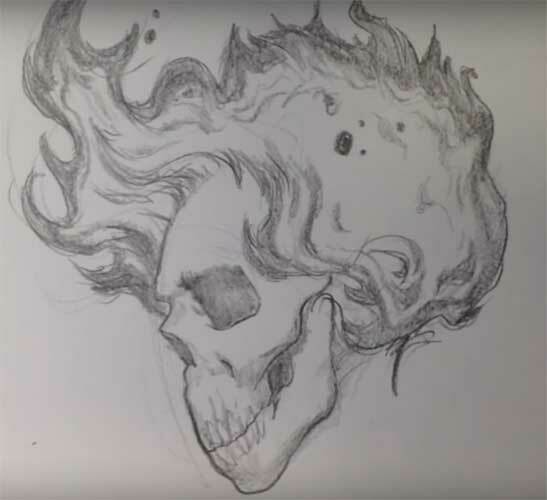 Erase the auxiliary lines and circle the skull. Stroke the picture, sometimes making blackouts. 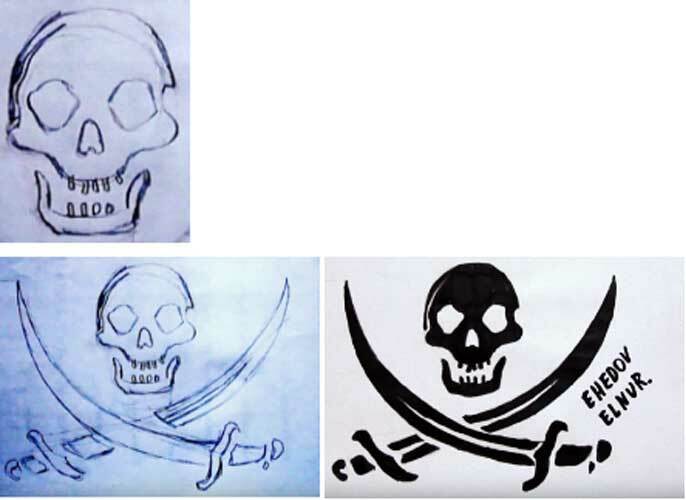 To portray the pirate flag is quite simple: the outline of the skeleton of the head and crossed knuckles, it is also called the Jolly Roger. But we bring to your attention the pirate flag of Jack Rackham, where sabres intersect. We already mentioned Jolly Roger in the previous paragraph. It has different variations in its design. The skeleton itself can be full-face or in profile, and the bones can be located below the head, or behind it. Outline the silhouette and line up the future bones. Draw one vertical and two horizontal lines. 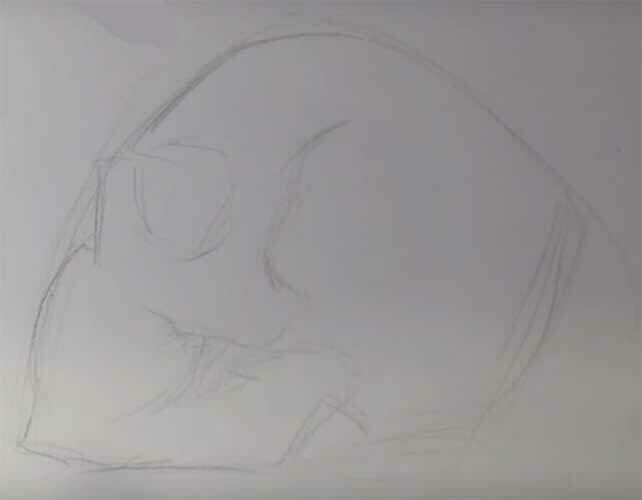 Draw the palpebral fissure, nose and jaw. Circle the contour of Roger and the bones. Next gently shade, use different tones of a blackout. We offer to watch the video lesson. Conduct various experiments. For example, to depict Adam’s head with a snake coming out of the sockets, by the way, this is a favourite tattoo design. The basic principles remain the same. First, make a sketch. Then, in the usual way, draw all the details of the head and draw a snake. Pay attention to the correct location of the head of the snake. Next, apply to hatch. We attach a video master class. Another famous tattoo art is the image of a skeleton with a rose or other colours. 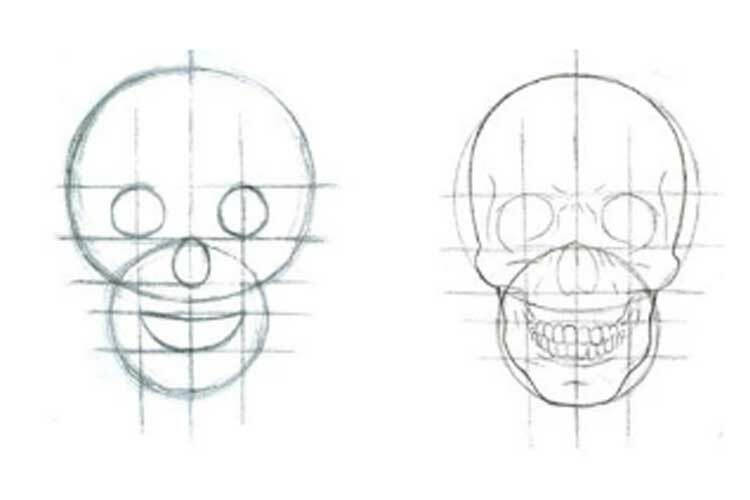 You already know how to draw a skeleton of a head from different angles, so it will not be too difficult for you. Pay attention to the image of roses. They need to be conveyed most plausibly, drawing each petal and adding volume with the help of proper shading. We offer here such a flight of fantasy, reminiscent of shots from the movie “Ghost Rider.” We will not load you with unnecessary words. In this example, you need to devote time to drawing flames. Look at the step by step example below.